Well you’ve probably ventured in on our little round table on Big Bang’s 4th mini album, Tonight (some of you were hoping for a more “proper” review but the round table was a good way to get multiple point of views too, we like to mix things up). If you’ve read the round table discussion, you would’ve seen that some of us were waiting on their live performances to save the, for lack of a better word, meh album from disappointment. Performance we want and performance we got! I took it upon myself to do a follow-up after I’ve seen what I wanted to see and have given the album a good listen (because while some songs are love at first listen, others need to grow on you). Note that this review is a quick one in order to prevent a BB overload and is in no way like Patricia’s reviews so lower your expectations :) Another note, this goes in hand with their live performance so you might want that page opened too. *i <3 moments are, to put it simply, favorite parts in a song. This refers to the album and not the performances. I said it before I’ll say it again: I dig it. The video for it was also slick as a video in the Vegas nightlight should be. This is a fun dance song but very average. As with any fun but average dance song, it’s not one that will stick in my memories for too long. If I ever hear this at the club I wouldn’t go, “Oh snap that’s my song!” The performance was good though. Who enjoyed GD’s tongue roll at 3:00 and TOP’s at 3:12? You know what the say about boys who can roll their tongues right? They make great machine gun noises! i <3 moment* at 1:50 goes to TOP for having fun with his voice. This is the song that changed my opinion the most. I went straight to this song when I first got the album because the teasers were tantalizing only to be disappointed because it sounded like the same shizz on the radio waves here in the states. After a few more listens–and perhaps there’s something about visually seeing them perform it and then present it in a music video–I like it infinitely more. It’s still very American pop/dance but…better. i <3 moment at 2:48 all the way to Daesung’s fatastic burst at 2:59. Loved Daesung’s teaser the most because of it. I’m gonna need a couple hundred more somebody to love’s in the chorus to remember the title of this song. For this pet peeve alone, I don’t like this song very much. But but but! The performance! All my attention went to the fun performance which made me tune out the repetitiveness. Therefore this song will never be heard by my ears unless my eyes get to see the performance as well. i <3 moment at 1:15 for a drunk-sounding TOP. The performance was exactly how I pictured this song: colorful old school video game-like graphics in the backdrop, cute choreography, girls in ugly leotards, just all around wholesome stuff that makes you want to hold hands after a fight and go get icecream. I’m a sucker for the bouncy beat so I like this song a lot. Soooooo smoooooooth and exxxxtremely sexxxxxy! If “What is Right” makes me want to get icecream, “Cafe” makes me want to put whip cream all over TOP and…errr I mean coffee, it makes me want to get coffee. I appreciate a song so hot it can melt chocolates and this is it. Still very much my favorite song on the album despite the falsetto. I too apologize for thinking it was all GD, but still. Don’t get me wrong the falsetto belongs in this song and it would’ve complimented very well if sung right but it was just off somehow and so they sounded like cats. A little less meowing and a little more purr like Mr. D-Lite or a rawr like TOP would have been nice. i <3 moment: Although TOP’s “coffee espresso double shot” at 0:40 makes me swoon, Daesung killed it at 1:35. Daesung don’t you ever feel like I don’t need you anymore! 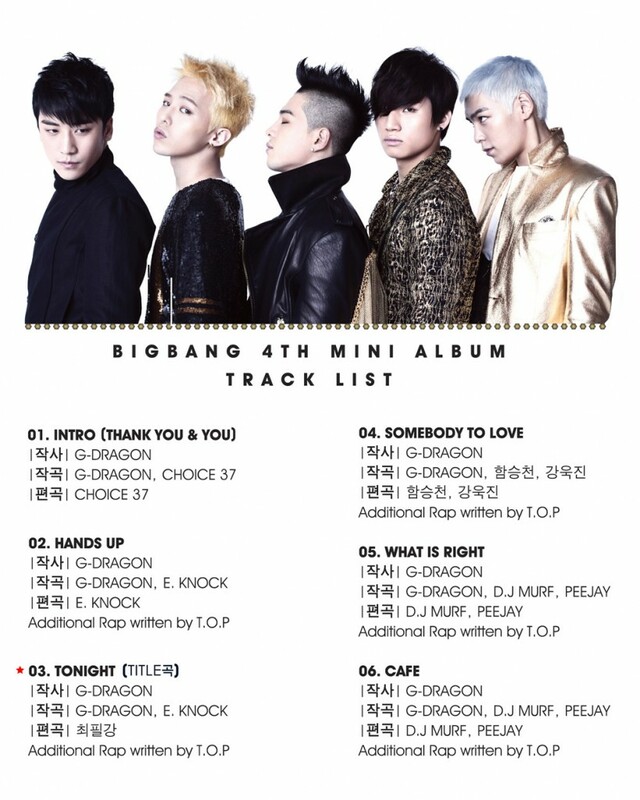 The biggest stand-outs on this album are TOP and Daesung. Is it me or did Daesung get more spotlight on this album? It was nice to see GD and Taeyang step back a little here. As for Seungri, well, he’s there. At this point BB wouldn’t be complete without their maknae so I’m not going to dig up another discussion on his role in the group. The mini as a whole was not too impressive but it’s no failure. I think it’s worth the purchase if you like dance . If you’re looking for hip hop/R&B, $1.29 is all you need to buy “Cafe”. Getting a visual of the songs really helped me enjoy the album more. I (well, Steven Tyler) initially gave this album a 2 out of 5. I’d like to change it to a 3.5 and YG has visuals to thank for that.